These are 5 practical tips and things we do ourselves that will help you get started, understand the process of storytelling, and make a great video for your business. The three components you need for a great video are a vision, a setup, and the event itself. The vision is where you hint at what is going to happen in your video. You don’t want to give the entire video away, but you want to have your opening shot entice the viewer. The setup is the build up. This is the part of the video where your viewer starts putting the vision together. Then there’s the event itself. This is where the story comes full circle to tell one complete story. You need to organize and plan your shots before you press record on your phone. What is your idea? What is the actual story you are wanting to tell? Get these thoughts and ideas out of your head and write them down on a piece of paper, put them in your phone, or send them in a smoke signal to the members of your team. 😉 It doesn’t matter how you get them out of your head, all that matters is that you do it. Now you’ve done that, you’ve given yourself a road map, helping you achieve the story you want to tell. Without pre-production, you end up wandering around trying to create the story you want to tell. This works sometimes, but most of the time you end up trying to find the story instead of telling the story. This will cause your videos to feel incomplete, misguided, and unprofessional. 1080p at 24 frames per second: 24 frames per second (fps) means you’re capturing 24 frames every second. Most movies you see in a movie theater are shot at 24fps because it has just enough fluidity and stutter that it creates a pleasing, cinematic look. 1080p at 30 frames per second: The choice between 30 fps and 24fps is mostly an aesthetic one. However, 30 fps will give you a smoother looking shot than 24fps. 1080p at 60 frames per second: This is a great frame rate to shoot in for slow motion. 60fps or higher (120fps or 240fps) will provide you with a high quality video with the ability to slow your video down in the editing process. This is the easiest tip we can give you to make the videos shot on your phone look more professional. Turn your phone horizontal. Simply turning your phone sideways makes a huge difference! This allows your video to fill up the screen and help you avoid those dreaded side black bars (dun dun dun…). Gear is a great tool to help you tell the story, but that’s it! No matter how amazing and expensive your equipment is, it won’t help you tell a better story if the story itself isn’t great! Now don’t get us wrong, equipment is super important, but don’t let not having the most expensive gear, or the newest phone on the market deter you from making a great film. As the saying goes, “The best camera is the one you always have with you.” And in today’s day and age, the phone we always have with us usually has an amazing camera. It doesn’t hurt that this camera comes with a bunch of filming and editing apps right at your fingertips. You don’t need a huge lighting rig or a professional studio to have great lighting for your video. Filming next to a window or a room that gets great sunlight naturally can do wonders for your videos. If you’re filming outside, always make sure to film during the golden hour. What is golden hour? Per our friends at Wikipedia, “Golden hour is the period of daytime shortly after sunrise or before sunset, during which daylight is redder and softer than when the Sun is higher in the sky. 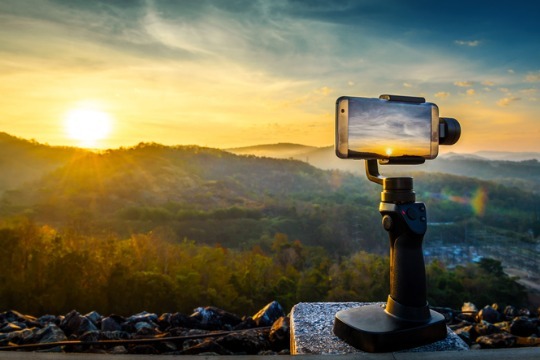 The opposite period during twilight is blue hour, just before sunrise or after sunset, when indirect sunlight is evenly diffused.” Filming during these times always adds a professional look to any video shot on your phone. An obvious tip that is overlooked all the time when it comes to lighting your scene is making sure to have the person who will be on camera face the light source. Filming with their back towards the light can cause the person on camera to look shadowy and back-lit. There you have it! We hope these 5 tips will help you become the next Steven Spielberg of your generation… or at least help you make some stellar videos for your business!